We sculpt dreams with lights and lenses and create worlds from a keyboard and mouse. We are storytellers and imagination dwellers. We are Creative Edge. You are unique…so why should your video productions look average? Creative Edge Productions is an award winning leader in creative marketing, video production, post-production and advertising services. 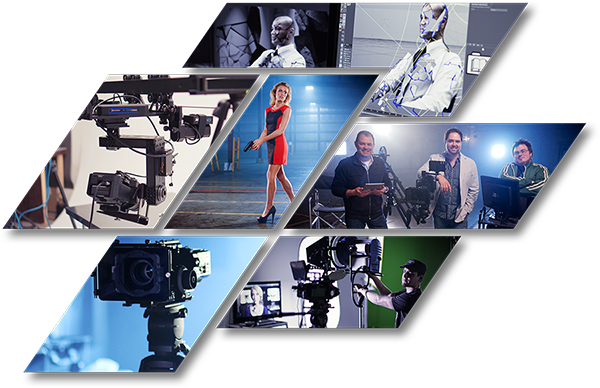 We have the experience and equipment necessary to bring your vision to life and have it stand out from the crowd. Get to know the team that gives us our creative edge. Take a 360° tour of our facility and see all our studio has to offer. Businesses who have relied on us to help bring their vision to life. One thing that sets us apart from other studios in the area is our gear. We have a large assortment of state-of-the-art equipment to meet the needs of any production. While some studios may need to rent things like a remote pan/tilt head, wireless follow focus, slow-motion camera, motion control system, etc. we have them all in house. Scalable to fit your individual production needs. Professional camera equipment and the experts who now how to use it. Concept development from award-winning professionals. Partnering with your corporation or agency, large or small, through all stages of development. Developing video for TV, web and mobile platforms. Fitting within your budget to give you the most effective video for your investment. Working with clients locally and around the world. All to help you unlock the true potential video has for your business.